I don’t know about you, but once my Christmas decorations were taken down and put away, my home felt pretty bare looking! It was time to think about some new decor to liven things up. 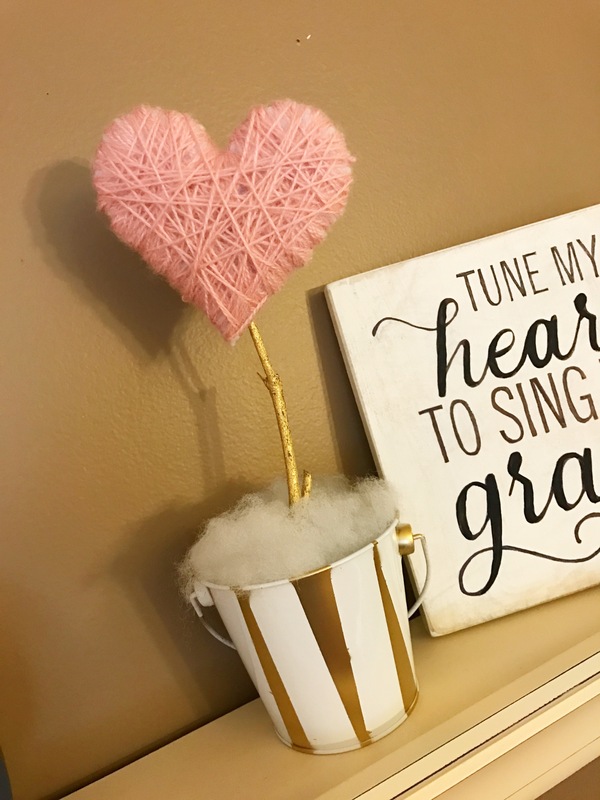 We recently moved into this home, so I am still working on decorating in general, but while in the midst of that, I wanted to come up with a little bit of Valentine’s decor for the next month. 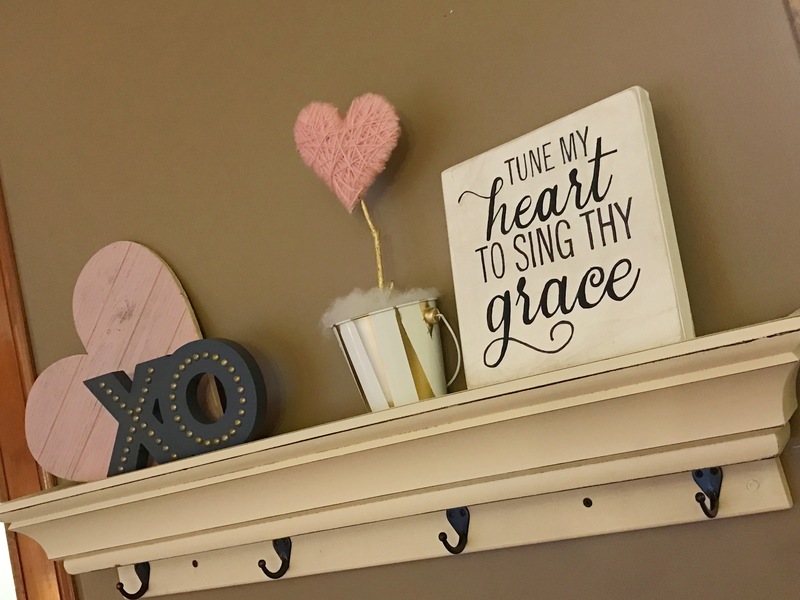 I found my rose pink wood heart and XO for very cheap at a nearby store, and had recently made the ‘Tune my heart to sing Thy grace’ wooden sign. They looked great on my floating shelf that you may remember from this post. But I needed a little something else to finish it off. I wanted to use things I had on hand and came up with a Yarn Wrapped Heart in a pail! 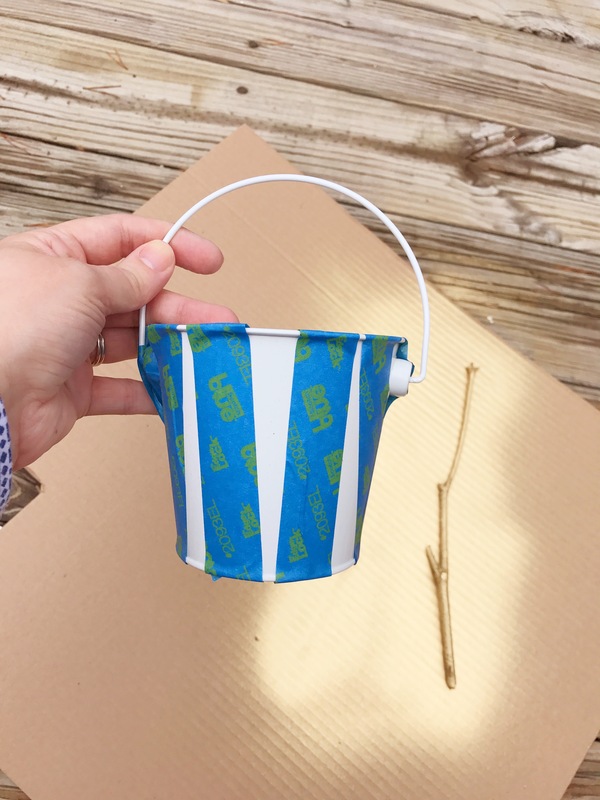 Spray paint your pail using masking tape to create a design, or paint it solid, or leave as is! Also spray paint your stick. 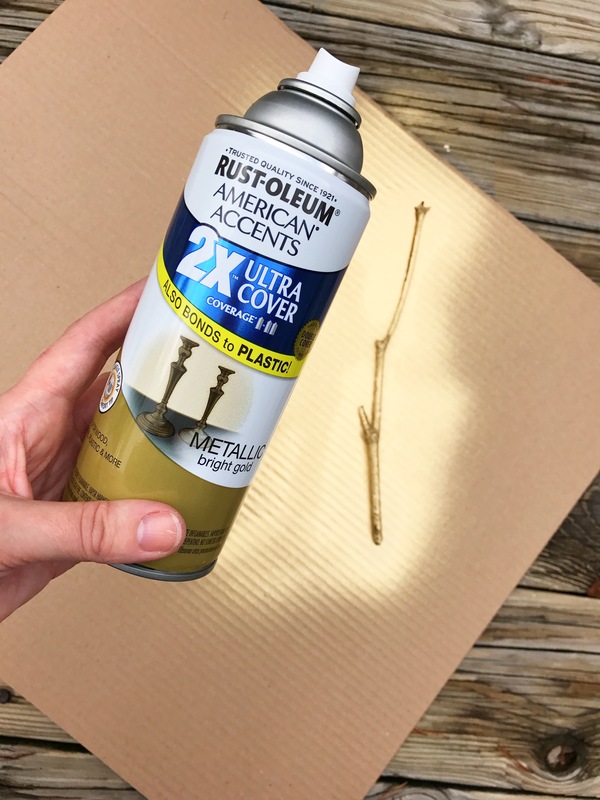 Cut a heart shape out of the cardboard. I cut a quick one out of copy paper and traced it. 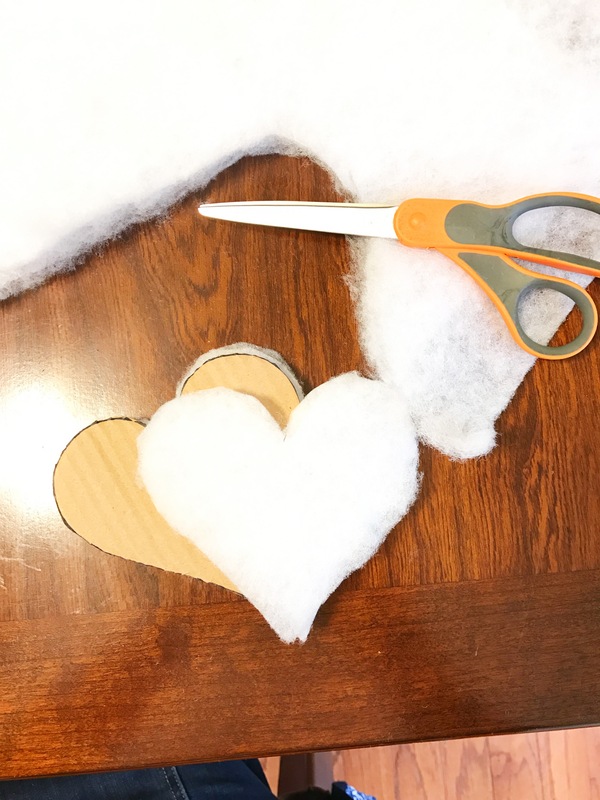 Using the same heart shape, cut 2-6 hearts out of your batting or fleece, depending how thick you want your heart to turn out. Layer your cardboard and fleece/batting, keeping the cardboard in the center and placing fleece/batting on both sides. I used a couple small pieces of tape to hold it in place. 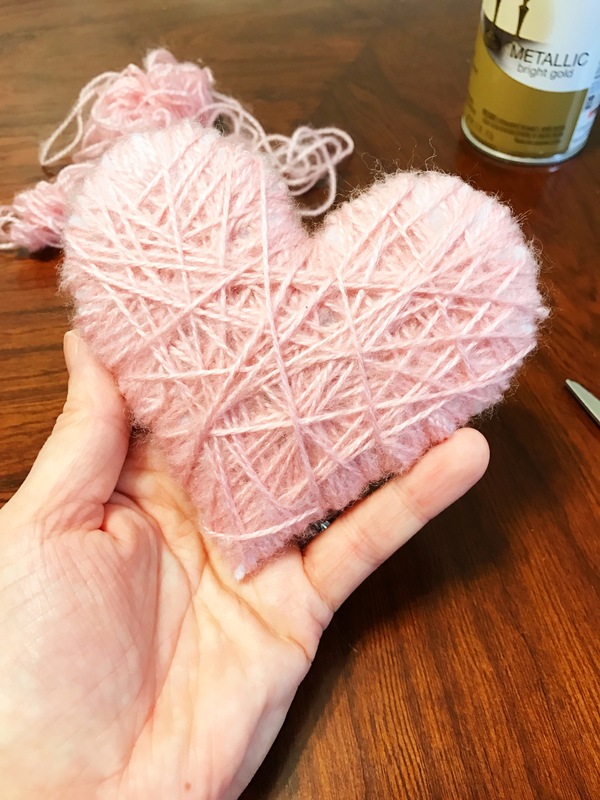 Begin wrapping your heart with the yarn. Wrap in random directions to get the desired effect and continue wrapping until it is pretty much all covered. Stick the styrofoam in the pail and push your stick in place. Now carefully slide the end of the stick behind some of the yarn to hold your heart in place on the stick. Use extra scraps of batting to cover the top of the pail. 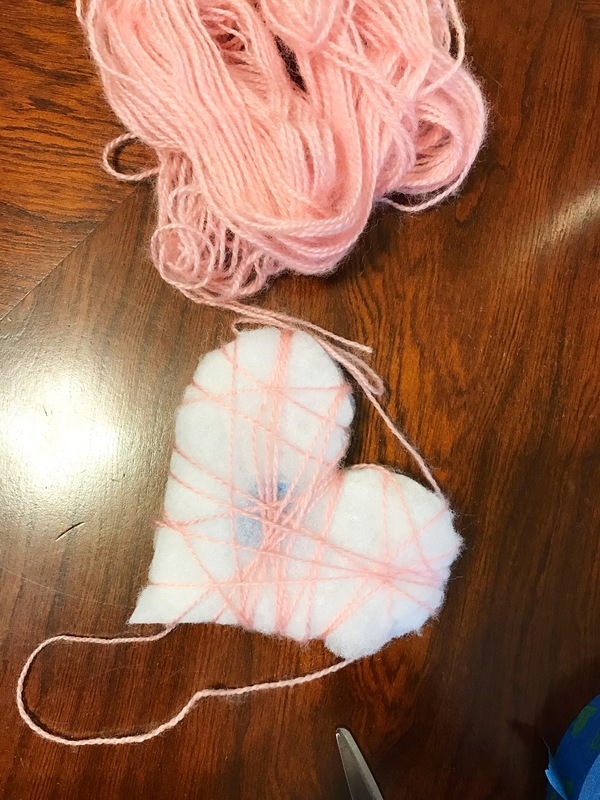 TAKE A LOOK AT THE PICS BELOW AND YOU’LL BE READY TO MAKE YOUR YARN WRAPPED HEART DECORATION IN NO TIME!